On a wild and windy night shortly before Christmas my dining companion and I exited Wembley Park underground station and followed the banners to the recently opened London Designer Outlet. We were blown down Empire Way towards Wembley Stadium, its arch silhouetted against the night sky and then turned off into a cluster of modern, illuminated blocks. We soon entered the outlet, much of which is, unusually, open to the elements and were surprised to find, so close to the festive season, a paucity of customers. Perhaps it has yet to become established, perhaps shoppers are waiting for more spring-like weather. Whatever, we graduated to the upper levels which are home to a multi-screen cinema (de rigueur it seems these days in shopping malls) and a plethora of restaurants, most of which are new offspring of familiar chains. Our destination was Ping Pong, one of the newer arrivals on the London eating scene, with its original venue in Great Malborough Street and an extremely popular one on the South Bank judging by the number of customers I spy there on my frequent walks past on the way to the Festival Hall or the National Theatre. Warmth greeted us as we entered, both in the ambient temperature and the pleasantness of the staff. Both of us having confessed to never having previously frequented a Ping Pong restaurant, we were enlightened as to its ethos and to its modus operandi. The neat phrase ‘Chinese tapas’ summed up the food on offer, a modern take on the teahouse stops on the ancient Silk Route that fed and watered traders along its many miles. The menu is extensive but divided into sections such as soups, fried and griddled, baked, rice dishes and, the longest section of all, steamed. Each dish is fully explained and, indeed, what you got matched its description perfectly. The recommendation was to order four or five dishes per person – we went for seven in total to start with and found that plenty. The tapas were small but quite filling. We indulged in one of Ping Pong’s unusual cocktails, all the ingredients blending beautifully into a delicious drink. As we expected, the tapas dishes arrived consecutively, wonderfully hot and obviously freshly prepared. The flavours and spices mingled perfectly; nothing was overpowered but everything was there to be tasted. All steamed items came in individual bamboo steamers, piled up on top of one another. Everything we ate was delicious, and it would be quite invidious to pick out favourites, but I have to say that the spinach and mushroom dumplings were my idea of heaven, and the sticky rice parcels of king prawn and scallop sticky rice wrapped in lovely green banana leaves, were my companion’s. But, there again, the har gau (prawn and bamboo shoot dumpling), the duck spring roll and the honey-glazed spare ribs were great too! Having no room for dessert, I rounded off the meal with an amazing jasmine and lily tea. Placed in front of me was a large glass with a strange looking ball in it. Hot water was poured over it and, over the course of two or three minutes the ball gently opened into a beautiful flower as the tea brewed. A lovely theatrical touch to a cup of tea! Despite the weather, there was a respectable number of customers in the restaurant (that can cater for 250), considering it only had been open for a couple of days. There was a good mix, different ethnicities, old and young. We took away our loyalty cards (which certainly will tempt me back to a Ping Pong in the near future) – even the paper chopstick holder had an offer for a free cocktail printed on it! And we headed back in the gale force winds, this time accompanied by lashing rain, to the underground station, replete and content after our Chinese tapas experience. Jeannette Nelson Food Critic and Restaurant Reviewer, as well as all things theatrically entertaining! What on earth can I give my lovely dad on Father’s Day? With two weeks to go why not choose food? There’s time enough to order and receive a pie or two from Adams & Harlow. An interesting variety of pies with unusual ingredients to choose from we rather liked the sound of the pie with seasoned pork and a layer of Lincolnshire Poacher cheese through the middle, topped with sweet roasted baby onions. It looks very tasty. We were rather taken with the named pies with pastry lettering. 2 x 1lb Traditional Pork Pies (Serves 2-3) The most extraordinary of all pork pies. 1 x 1lb Huntsman Pork Pie (Serves 2-3) A jellyless pie, layered seasoned pork meat and tender chicken breast topped with a classic sage & onion stuffing. 1 x 1lb Poachers Pork Pie Seasoned pork with a layer of Lincolnshire Poacher cheese through the middle, topped with sweet roasted baby onions. Another suggestion: Take your dad to a Fyne’s restaurant for some super fish dishes. We’ve eaten twice here and both times loved the menu offering interesting and tasty dishes. The presentation is always excellent. Their menu is seasonal and for Father’s Day a Specials Menu has been carefully put together. Could be brunch, lunch or dinner. Dining after 6? Then you will receive a complimentary glass of prosecco or a bottle of Old Golden Hen beer. The specials on offer include the Fisherman’s Plate starter, a feasty combination of potted and peppered Scottish mackerel, classic Loch Fyne smoked salmon with capers, Brandan Rost fillet, Kinglas fillet sashimi style, rollmop and Madeira-marinated North Sea herrings with crusty brown bread. Mains include a half lobster tail with chargrilled octopus and clams and, for those unable to decide between the delicious meat and fish dishes, there is a Father’s Day Surf & Turf option, tender sirloin steak with a half Canadian lobster tail served with bernaise sauce and french fries. There are some mouthwatering desserts, or a luxurious cheese choice served with a dram of Glenfiddich whisky. If your dad isn’t a fish lover there is an a la carte menu that includes a large selection of meat, poultry and vegetarian dishes. However if pies and restaurants are not your thing, why not make him a really luscious strawberry dessert. Sweet Eve is a new variety promising a sweet full flavoured berry. This impressive Strawberry Victoria Sponge is easy to make, so great for kids to prepare ahead for Father’s Day, with a little help from Mum. Serve Dad up a mighty, manly slice. There are more recipes to choose from, have a look at http://www.sweetevestrawberry.co.uk/recipes/serving-ideas.html We were impressed! Whatever you choose for your dad I’ll bet he’ll love it! It’s good for you both to make him feel special. thIt’s not often an overnight stay in a hotel or bed and breakfast is anywhere near as comfortable or pleasant as being at home. All too often beds are uncomfortable, or the bathroom has mould in the grouting, or the carpets need a real clean in the corners, or the windows rattle, or worse they don’t open. Or there are just not enough towels, or the heating won’t turn down, or the air conditioning needs attention – too noisy! The breakfast is fine but the seats are uncomfortable, or the cutlery needs a polish, or there are fingermarks on the sugar bowl plus a ring of coffee on the base – that happened in a five star hotel in Birmingham. I passed a photograph to the manager. He promised to post it on the staff noticeboard! Which all reflected badly on the establishment which was a shame because the eggs benedict was scrumptious. As you probably gather I have stayed overnight a lot as a travel writer in mostly top quality hotels in many different countries and I am so pleased to say we were very impressed with our night’s stay at Swanson House in Brough, Cumbria. Booked without recommendation or from a list of where to stay, just a search on the web for somewhere to stay in the nearest town to where we had a meeting. We found the room welcoming, the beds comfortable, the decor pleasing, the en suite a good comfortable size and beautifully clean. In fact everything was clean and appealing, not in the least pretentious. The complimentary beverages were high quality. Fresh ground coffee in a well sealed container, crockery was clean and shiny as was the cutlery. There was a sitting room next door we could use with complimentary fresh baked cake to sample and for those who wanted to, there was a microwave to heat up anything required. After a good night’s sleep – the room was at the back of the building, away from traffic and street noise – we went down for our breakfast. We can’t face a full English first thing in the morning and we had requested a continental breakfast. It was just right. Not too much, not too little. Appetisingly presented, great to taste, the table laid out with crisp white tablecloths, sparkling cutlery, glass and crockery, fresh coffee, beautiful curled butter pats, prepared fresh fruit in bite sized pieces. The effort Pat Jones, the owner, put into presentation made it a memorable breakfast and how many times have I ever written that? I think this is the first! The picture was taken from Brough Castle, courtesy of The Westmorland Gazette. Before becoming a consummate cook and most welcoming host, Pat was sub-Postmistress. She ran Brough Post Office with her husband Philip for many years before it was closed in the Government programme of closure about 5 years ago despite tremendous resistance from the local community. A protest march was held, a local resident dressed as Queen Victoria, and told the crowd of her displeasure at the proposed closedown. Then around 130 local residents gathered to show the strength of feeling in the community by spelling out their plea to save their village post office. All to no avail sadly. Pat and Philip decided to renovate and convert the Post Office into a restaurant with bed and breakfast and continue living there. Swanson House is now a popular restaurant for locals and tourists alike. Rural business is having a hard time economically and Swanson House is an outstanding example of triumph over adversity, it was ‘Good Taste’ winner in the Upper Eden Business Awards 2012 and 2013 runner-up. So the killer question: Would we go again? The answer? A resounding yes, and yes again! Next time we will be sure we allow enough time to sample the mouthwatering menu. And be sure to book in advance, giving details of our choice from the menu. This is Pat’s way of making quite sure your meal will be cooked to perfection using the highest quality local fresh produce, a hallmark of your visit to Swanson House. The wine list was attractive too … Ooh, can’t wait to go again! Wagamama: Great Food! Great Summer Menu! My first visit to Wagamama in Lexington Street earlier this year was memorable, good food, clean and pleasant surroundings, food freshly cooked and served quickly. So when I heard about the new summer menu I decided to take two guests, who had never visited Wagamama before, to try it out. It didn’t disappoint. My guests, mother and daughter, were surprised and interested in the food. Surprised because it looked so inviting and interested to discover the taste of dishes new to them. As always we were all watching our waistlines so we shared every dish trying everything on the new summer menu with the exception of Firecracker – a hot spicy dish that we felt would appeal more to the male members of our family. Wagamama is well known for its noodles and we loved the Yasai Pad-Thai – egg-fried rice noodles in a tamarind sauce with fried tofu, beansprouts, leeks, chinese chives, spring onions, garlic, ginger, mint and chillies, garnished with coriander cress, fried shallots, peanuts and lime. Tasty and very flavoursome it is very suitable for vegetarians. The two fruit drinks: Apple, mint, celery and lime and Orange berry bang that included passion fruit, were absolutely fab! We really enjoyed the Beef Kushiyaki – skewers of beef rump steak marinated in lemongrass and lime leaf, glazed with a smoky sweet soy sauce and Chicken Kushiyaki skewers of grilled ginger and mint infused chicken meatballs glazed with a smoky sweet soy sauce. The Lollipop Prawn Kushiyaki – skewers of grilled prawns marinated in lemongrass, lime and chilli glazed with a sweet-sour and hot sauce and served with a caramelised lime were quite delicious. Our eyes lit up at the accompanying fresh crunchy summer salad – Vegetable chop salad miso marinated fried aubergine, baby plum tomatoes, avocado, caramelised red onions, pumpkin seeds, roasted sweetcorn, red cabbage and mangetout tossed in a miso dressing, garnished with celery cress. We saved enough space to try the two new desserts: frozen yoghurts, all low in fat, pro-biotic and with natural flavours. A choice citrus yuzu, strawberry and five spices toffee and black cumin seed, mixed yoghurt in any combination. The five spices toffee was a favourite. The new passion fruit cheesecake – a creamy soft cheese on a real biscuity tasting base and mouthwateringly good passion fruit sauce. I’d have this any day! In fact my mouth is watering right now! So would we go again? Yes, yes and yes again! Whether we want to drop by for a snack, lunch or evening meal, on our own, with friends and or family, it would be most appropriate and we could rely on a consistently good menu. There’s lot to choose from and the serving staff are very, very helpful and full of advice for those unfamiliar with the menu and type of food – that’s us! Can’t say enough good things about it! By the way, we stuck to water with our meal but there is a comprehensive and inexpensive wine list. We had a cup of refreshing flowering jasmine tea to finish off our most enjoyable lunch. The next seasonal menu change will be end of autumn – can’t wait to try it! Wagamama Lounge – Wagamama sets up an outdoor eatery with music and art for festival-goers. For 2012 it’s Manchester, The Isle of Wight and SummerSundae Leicester. You can find out more on the website www.wagamamalounge.co.uk There is a Nokia and iPhone app. PS Just found out TakeOut is on the menu!!! Why not plant a tree with dad? Wine holiday in Oporto Built into the hillside of the spectacular Duoro Valley, The Yeatman hotel in Oporto is inspired by the celebrated wines of the region. Guests can seriously indulge themselves during the weekly wine evenings, tasting soirees and cookery courses. The extensive wine cellars hold 25,000 bottles alone and the in-house Michelin starred chef, Ricardo Costsa, is always on-hand to educate guests about food pairing. Even The Yeatman’s vinotherapy spa will be difficult for Dads to resist, as it offers a Cabernet Sauvignon Barrel Bath or body scrub. Prices from €150 per night. Or he might have loads of the stuff in the cupboard but may not have some luscious glasses to savour it – we would choose the beautiful Riedel Port Glasses available at John Lewis and Amazon. How about a short holiday break for someone mad on fishing? Forget Salmon Fishing in the Yemen although a couple of tickets might go down a treat! – how about Fly fishing in the Maldives All hard-working fathers deserve peace and quiet once in a while, and you would be hard pressed to find a more relaxing and tranquil outdoor pursuit than fly-fishing. On a secluded private island in North Maldives, Island Hideaway resort boasts deepwater channels and expansive shallow flats, ideal for whiling away the hours until that longed-for catch comes along. Prices from £1350 per week during low season, and £2300 during high season. OK, so that might be a bit over the top! How about The Ultimate Guide Book to Fishing? This Google page might give ideas. Right, nothing so far appeals? What about a luxury wet shave? Harking back to simpler times when every man had a trusty barber to see to his beard and whiskers, in London the Spa at Dolphin Square offers chaps the rare chance to pamper themselves with a range of traditional Moroccan wet shaves. Choose from the age-old Savon Noir shave, which cleanses by combining crushed olives, olive oil and Eucalyptus (£35), or go all out with a Moroccan Cleansing Ritual, incorporating a Hammam and Shea Butter Massage, followed by the relaxing shave (£104). This would appeal to many men I know so it could be a winner! On a more basic level though why not a gift voucher from B&Q? Lots of us like browsing in DIY stores, especially new and improved gadgets! Or why not some Ogilvy’s honey – their Balkan Linden Honey is rather special. Gathered from colonies in the Danube region of Serbia. This honey was one of four varieties of Ogilvy’s Honey to win gold stars in the 2011 Great Taste Awards organised by The Guild of Fine Food. It is rather special – you can find more information on the Ogilvy’s website. If you live in or near London then of course you could take him for a meal – Ping Pong in Soho is excellent, The Sanderson in Berners St has a wonderful dining area as has the Lanesborough Hotel opposite Hyde Park Corner. What about some tickets to a game at The Arsenal? A visit to the House of Commons to see Parliament in action and a meal in one of the boats on the river. Or a boat trip on the Thames? Of course you could just go for a walk in Hyde Park and have something to eat in one of the many cafes in the park. Or how about an App for his iPhone or iPad – he doesn’t have one? There’s two more ideas! Hope you might find one of these inspiring! Good luck – you have just three days left! Fancy a Free Meal? Really! 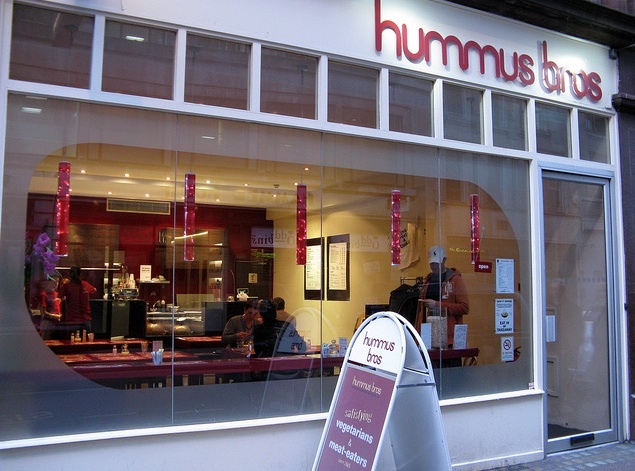 On Sunday, just take your unwanted items into the Wardour Street branch of Hummus Bros where you can haggle the value of your possessions with staff from the Marylebone Cancer Research UK shop. Vouchers will then be given out matching the value – two or three good quality donations should be enough for a completely free meal! Barter Day runs from midday to 6pm on Sunday 19 June at Hummus Bros, 88 Wardour Street, Soho, W1F 0TH and all quality donations will be accepted. To get directions, see their mouthwatering menu and see what journos thought of the cuisine see the Hummus Bros website. With Barter Day, Hummus Bros continues to offer unprecedented value while being socially and environmentally responsible – keeping your conscience and tummy happy.